NYC, 02/06/2019, 6:30PM. 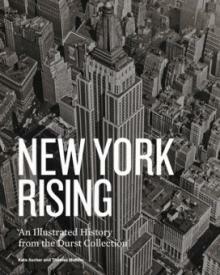 New York Rising: An Illustrated History from the Durst Collection. New York Rising is a richly illustrated history of real estate development in Manhattan that draws on the wealth of books and historical objects in the Durst Collection at Avery Architectural & Fine Arts Library, Columbia University. Editors and authors Kate Ascher and Thomas Mellins invited ten Columbia scholars to compose narratives of their areas of expertise, ranging from Dutch governance of Manhattan to recent reclamation of the city’s waterfront as a public space. The resulting volume is a story of speculation and innovation – of the big ideas, big personalities, and big risks that collectively shaped a city like no other.